This big, comfortable and luxurious house with a truly breathtaking view is in a top location right by the sea, in the lovely little tourist town of Pirovac between Zadar and Sibenik. Owing to its size and layout, it is ideal for several families who would like to spend a quiet seaside holiday together or for the guests who like their own privacy and space. The beach is right in front of this attractive holiday house. The house is spread over three floors, connected by internal stairs. It has a modern and high-quality interior and provides a total of 360m² of living space for 18 people. The house has three big living rooms with three open and fully-equipped kitchens with dining spaces, as well as nine bedrooms and three bathrooms. Each living room has air conditioning, both cool and warm,five portable fans are also available. The house also has central heating with radiators in all the rooms and free wireless Internet access. Each floor has a very modern bathroom with a shower, washbasin, WC, bidet and plenty of storage space in the cupboards. The two furnished balconies afford a lovely unobstructed view of the sea right in front. The ground floor also has a roofed terrace with seating. There are seven parking spaces in front of the house in the enclosed courtyard. 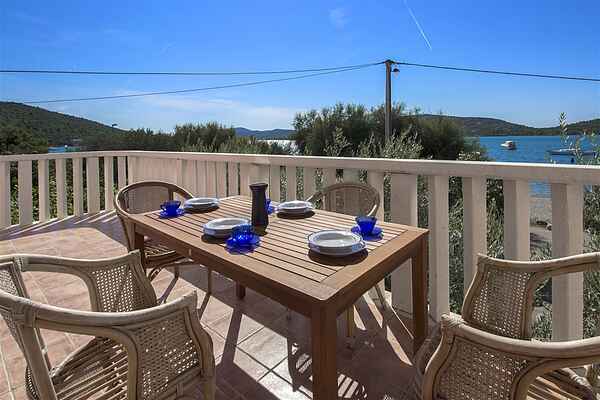 Owing to the top location, it is just a few metres to the beach and the sea. It is just a two-minute walk to the centre of Pirovac 300 metres away with its amenities, bars, restaurants and shops. Grocery shops, a bakery, a butcher and a fishmonger are all just 200-300 metres from the house. Pirovac has many sandy and stone beaches with a lot of bays with pristine nature, just a short distance away. The nearby towns of Sibenik, Vodice and Murter are within easy access by bus and var. The town of Sibenik, which is full of cultural and historical sights, and the nearby town of Vodice, with entertainment and good gastronomy, are definitely worth a visit. The Krka and Kornati national parks with their natural beauty are also ideal as day trips.